OCCUPY FORT DUQUESNE How can this urban void located under the Ft. Duquesne Bridge overpass become a public space? Shaping the space to balance flexibility while giving an identity and sense of place stipulated the reinvention of a new design language. 1,000 to 3,000 milk crates turned up to be the perfect tool: They are modular and offer many layout configurations. They are comfortable: one can sit on it, lounge on it. They are flexible: they become furniture, construction blocks. They are stackable, easy to put away. They are light and can be moved around easily. They are inexpensive. They are playful and interactive. They are durable. They are desirable. We propose a ‘Second Life’ program that encourages the community to take this highly coveted module and transform it according to their needs... And they are yellow and refer to the iconic Aztec gold color that defines Pittsburgh. CELEBRATE THE RIVERS 2018 marks the 260 year anniversary of Pittsburgh. This summer, let’s celebrate the rivers! Our scheme responds to the fluctuations of the river and uses flood as leverage for design. 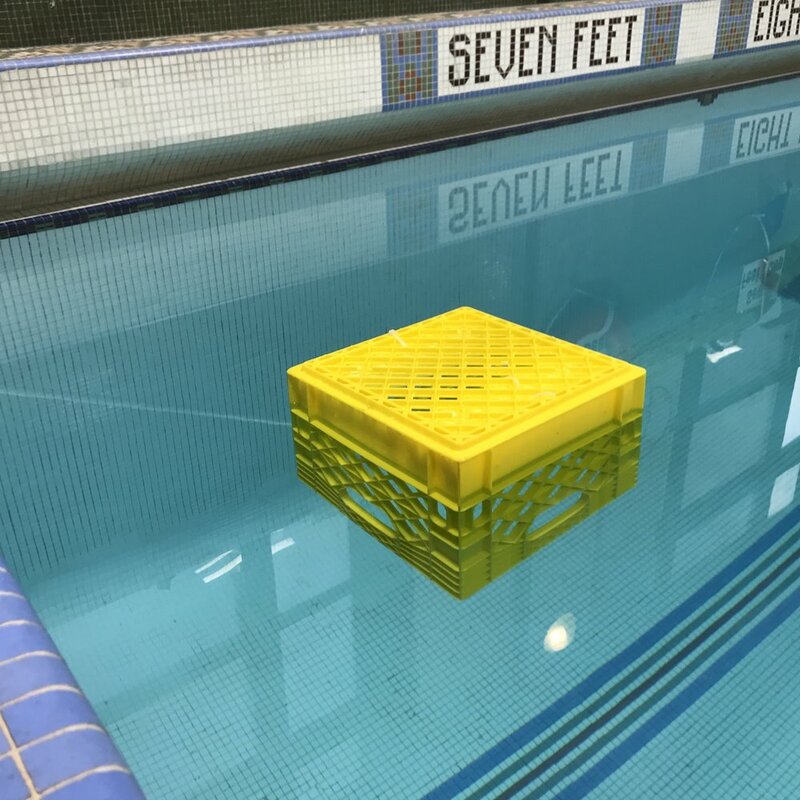 When the site floods the crates equipped with flotation devices lifts up and stays dry until the water recedes leaving a trace of the river. This presents a playful spectacle on site while keeping the maintenance after flood to a minimum. Grow With The Flow memorializes the floods with the tallest bridge column bearing the marks of the past 100 years floods – from the 46ft mark of the Great St. Patrick Day flood of 1936 to the 2005 flood. REVEAL NATURE’S FORCE The bathymetric map reveals the topography of the riverbed invisible to us at the water edge. We propose to extend theses contours onto TBD site, softening the hard edge of the river while reminding users that the river occupies the site occasionally. The 2-dimensional representation of topography is traced with blue temperature sensitive paint that transitions into yellow at a specific temperature threshold. The thermochromic paint’s immediate and interactive process captures nature’s lack of fixity. The contour lines render the concept of landscape as part of an interconnected system, which extends and connects to other systems around it. Grow With The Flow aims to reestablish our relationship with nature. This project included a public engagement stage. Our main objective was to understand better the relationship between people and the Allegheny River to advocate for a better relationship between people, other living things, cities and larger natural systems.